Improving your filtration systems is not something that you think about everyday. We take it for granted that we have filtration systems installed in our homes, schools and workspaces that enable us to breathe in uncontaminated air. Indoor air pollution is caused by different particles and gaseous emissions. Trends show that these pollutants are increasing year over year. There are several different types of particles such as: viruses, bacteria, allergens, asbestos, fiberglass and mineral wool. As these contaminates build up, it will eventually cause problems in places of residence and work. Employees might not realize the severity to the problems they have noticed in the filtration systems. As filtration systems start to fail, employees will start to show more symptoms of fatigue, which will hinder their ability to complete their tasks for the day. Operating filtration systems is incredibly important to Lifa Air. We take pride in the fact that we can find a solution that is customized based on each individual client that we operate with. Designed for superior filtration, our Lifa Air 3G Filters and Lifa Air High Security Filters prevent the spread of airborne contaminants by effectively removing harmful particles from the air supply. 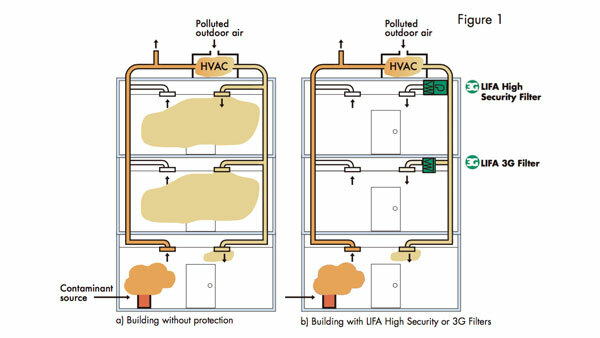 Our Lifa Air 3G Filters and Lifa Air High Security Filters operate with a low-pressure drop, permitting easy installation without the need for expensive modifications to existing HVAC systems. Units can be installed at the point of entry to target specific rooms. Mobile units are also available for hospitals and other emergency purposes. The Lifa Air High Security Filter comes with three components that creates fresh air. The first component of the 3G Life Air High Security Air Filter is the UV light system. The UV light sterilises viable particles that are trapped on the filter bag. The second one is the charger. The charger can charge the particles up to the saturation charge level even at the maximum airflow. The last non-optional component are the non-woven dipole charge filter with an activated carbon bed. This carbon bed is made for filtration of charged particles, ozone and gases with low vapour pressure. There are also two optional parts of the Lifa Air High Security Filter. The first is the fan which ensures the air flow in the filtration system. The second one is a bed of granular activated carbon impregnated with reactive chemicals. 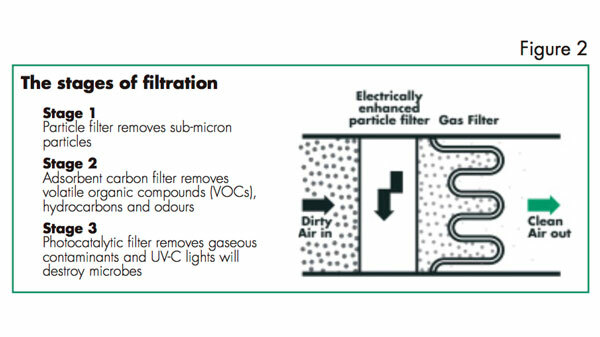 The Lifa Air filtration method filtrates 99.99% particles and up to 95% gasses. Our filters are made for long lasting service with low maintenance costs. They are easily retrofitted into existing heating, ventilation and air conditioning systems. You can find out filtration systems used in schools, hospitals, office buildings, yoga fitness centres, isolation rooms, FCU hotel rooms, and ambulances. The latest breakthrough in filtration technology increases efficiency by combining an electrostatically charged filter with both a particle charging section and a gas filter made of activated carbon media. A nanoelectric UV light can be added to the system effectively destroying any airborne virus or bacteria, including microscopic molecules. The Lifa Air 3-in-1 Green Filter is designed to maintain healthy indoor air by preventing airborne contaminants typical to urban environments, such as PM 2.5 particles, PM 10 particles, VOCs and odours, from entering room air. It provides heightened, although not complete, protection against biological agents and removes some chemical agents with low vapour pressure. The Lifa Air 3-in-1 Green Filter is energy saving with low pressure drop and low UV energy consumption. This filter comes in two different models. The K model is a fixed stump, while the M model has wheels attached. The system can be installed as an integrated part of the ventilation system or as a separate unit to filtrate and circulate indoor air. The K model version of our filter works simultaneously as an as an integrated part of the ventilation system and as a unit to filtrate and circulate indoor air. The green filter does not have a prefilter. The system has its own blower for each unit. UV-light can be installed as an accessory and are EMC protected. The LIFA High Security Filter system is specifically designed to provide protection against both biological and chemical agents. Air from outside has a lot of impurities containing nitrogen emissions from traffic, allergens and VOCs. Finding a solution can be difficult as most filters are not sufficient enough to remove these impurities. The high security filter uses the multistage filtration process to remove these hazardous materials from the air. The high security filter equipped with the 3G filter retains the finest impurities, solids, liquids and radioactive particles. Added with an optional ultraviolet light it destroys bacteria collected on the particle filter media. The air flows then through the NBC activated carbon filter, which can adsorb gases by physical and chemical action. A centrifugal fan compensates the pressure drop caused by all filters. The Lifa 3G Filter is used as a pre-filter to reduce clogging and loading of the NBC-filter thus allowing continuous protection of the occupants.